Looking For The Best Gloves for Cold Weather Motorcycle Riding? Here’s a look at our favorites, including our top pick – Joe Rocket Wind Chill Men’s Cold Weather Motorcycle Riding Gloves. 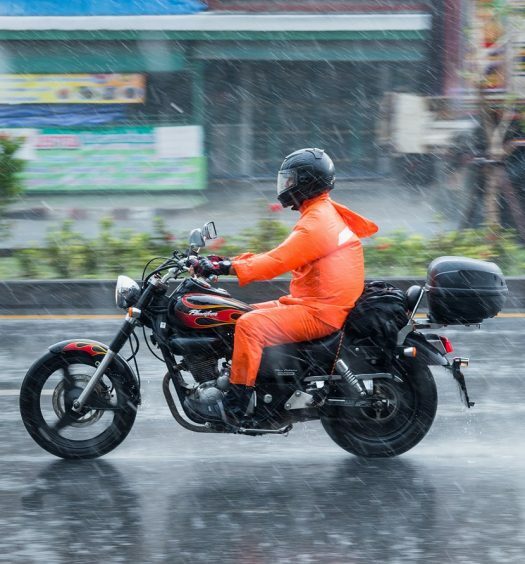 Riding your motorcycle in the fall and winter seasons can be less than ideal. There can be patches of ice on the road, and sudden bursts of snow fall or rain. However, when you do find an occasional sunny day this winter, then it’s probably best to hop on your motorcycle while you have the chance. It’s going to be cold though, and likely those old motorcycle riding gloves you’ve been using all summer are not going to cut it. That’s why we’ve put together our list of the top five gloves for cold weather motorcycle riding. Depending on where you live, like the southwest, then you might actually be able to continue riding for most of the winter. 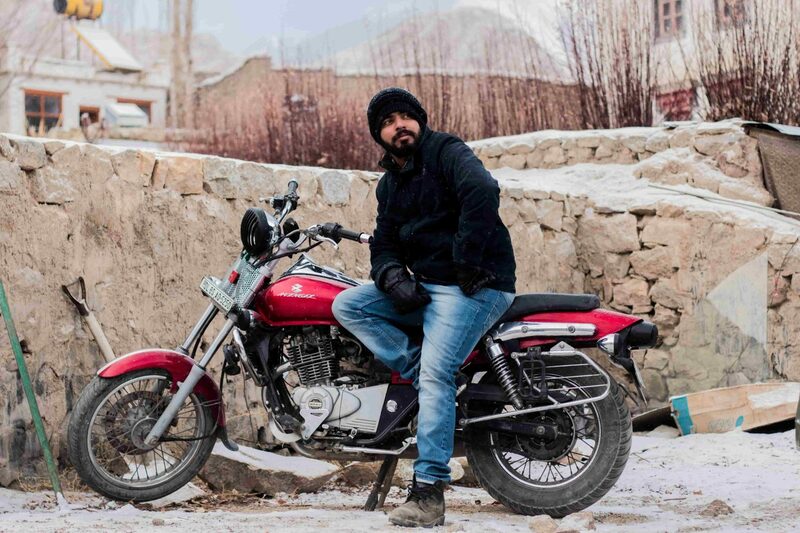 But regardless of location, everyone still needs a good pair of cold weather motorcycle gloves. The wind chill can render your hands useless if you’re not careful, and pulling that clutch in might turn into a battle of will. Don’t let your hands freeze, choose a pair of cold weather motorcycle riding gloves today. Now, let’s take a look at our top five that does include some thinner styles, some gauntlet styles, and even a pair of electric heated gloves. 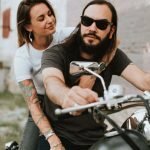 Joe Rocket is known for their stylish and affordable motorcycle riding gear, and we’re excited to say that their line of winter riding gloves in no different. For optimum warmth, Joe Rocket relies on a supple drum dyed cowhide outer layer and a waterproof dry tech mid-liner for the inners. Joe Rocket’s Wind Chill Cold Weather Riding Gloves include a 100G thinsulate for the perfect combination of comfort, dexterity, and warmth. Also they’ve integrated the ultra-high density knuckle armor for better protection during any unexpected wipeouts. 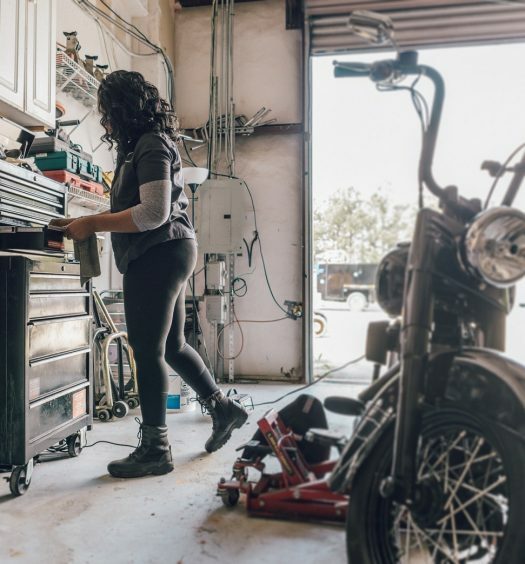 Their gloves use leather reinforcements throughout the design, as well as a vibration dissipating gel in the palms for particularly bumpy bikes. These wind chill gloves are designed with a pre-curve, so you don’t need to break them in to comfortably enjoy your ride. These are rider-friendly gloves, ready for your throttle and clutching needs with articulated full-flex expansion panels on all the fingers. Like many other winter gloves, Joe Rocket also includes secure hook and loop wrist closure, as well as a toggle and draw cord at the top of the cuff to keep in the warmth. 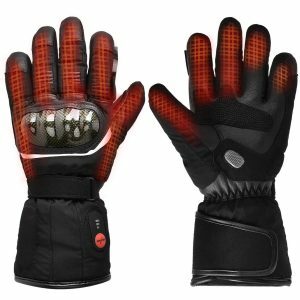 Battery powered heated gloves are excellent for rider’s who want to experience some serious warmth. If you’re a tech nerd, you’re probably naturally drawn to these electric gloves, and we wanted to make sure we include something for everyone. These electric motorcycle gloves are primarily made of sheep leather and polyester making them windproof, waterproof, and very breathable. The inside is made of soft fleece and insulated cotton for added comfort. The heating element itself covers the whole back of the hand, all the way up to the finger tips. The heating mechanism of these gloves can be used to stimulate blood circulation, making them a fantastic choice for anyone with arthritis, bad circulation, or just stiff joints in general. Additionally there’s a touch sensor on the index finger and thumb of these electric gloves, allowing you to still utilize your smart device for maximum convenience. There are 3 settings available on the temperature controller making heat adjustment extremely easy. The heating ability works for up to 2.5 to 6 hours, and the gloves can be fully charged in 3 to 4 hours. If you’re at all skeptical about the functionality of these gloves, there’s also an included 1 year warranty for your peace of mind. 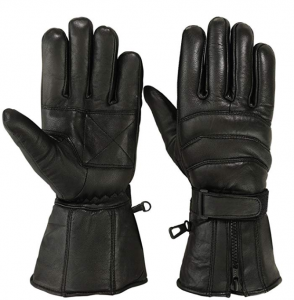 Our next choice is a pair of cold weather motorcycle riding gloves made from genuine leather. They include an adjustable wrist strap for optimal cold protection, and a zipper closer to really seal in the warmth. The distributor offers fast & free delivery, so if you know the cold front is moving in and you’re looking for straight forward genuine leather gloves, then order these today. There’s not too much to be said about this amazing pair of Motivex cold weather motorcycle riding gloves. If you love a simple, no nonsense, minimalist design, and extra warm hands, then these are probably the gloves for you. The OZERO Waterproof Winter Gloves are both practical and stylish. Just looking at these winter gloves can make your hands warmer… just kidding. However, the elastic knitted cuff closure is an excellent and warm design choice your hands will definitely appreciate. 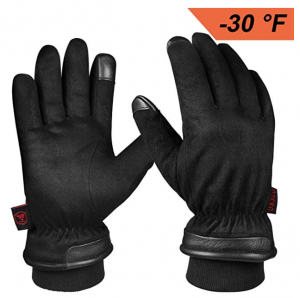 When it comes to cold weather motorcycle riding your gloves need to be both water resistant and insulated. The OZERO waterproof winter gloves feature a water resistant polyester shell and an insulated waterproof velvet lining. The OZERO’s feature a waterproof, windproof, and yet breathable coziness for your hands. OZERO’s gloves offer cold resistance up to -30°F, and are actually comfortable at -15° F.
These gloves are excellent because they’ll keep you warm during your cold weather winter riding sessions, and you’ll still be able to use your touchscreen. Lastly, the company offers a 90 day warranty if you contact them directly about any defects or even wrong size/style issues. The Blok-IT Full Leather Motorcycle Gloves are another pair of well-designed classic style gloves. 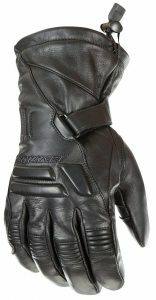 These full leather gloves are warm and comfortable outdoor gloves perfect for cold weather motorcycle riding. They feature an extremely comfortable flexible fit with a 3M thinsulate material for optimum wear ability. 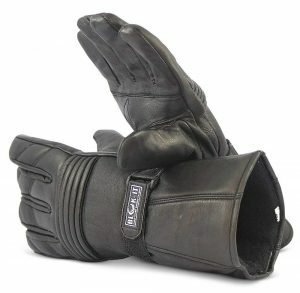 Ideal for the winter season, these Blok-IT leather motorcycle gloves offer superior grip to other gloves on the market. For cold weather motorcycle riding, you’re looking for gloves that offer both maximum comfort and durability while offering top of the line winter cold protection. The Blok-IT full leather motorcycle gloves have it all, making them the perfect gloves for cold weather motorcycle riding.